972: Catching up with Meals - Twokinds - 15 Years on the Net! Natani: (in Keidran) She agreed, and next thing I know, I’m in a burning ship! Keith: (in Keidran) Wow! That’s how it really happened? Keith: (in Keidran) So then… everything’s fixed? 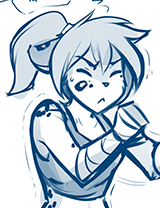 Natani: (in Keidran) Well… no. The link is suppressed, but it’s still there. And even if it wasn’t, no mental pep-talk is going to reverse black magic, or undo years of experience. Natani: (in Keidran) And I wouldn’t want it to. Pleasant or not, those years made who I am. Natani: (in Keidran) But I’m learning to… accept the other side of myself a little bit more.This body is mine. And my past is a part of me. Keith: (in Keidran) But I’m glad it means you’re back. Natani: (in Keidran) Yeah me too.